THERE'S nothing like a road trip in Europe to get that holiday adrenalin pumping. Try renting a car in Italy's Amalfi Coast, for example. The sight of crazy scooters, daredevil drivers and humongous coaches tearing around corners straight at you is enough to get the blood pressure rising and your passengers praying. Fun? Yes, as long as you have a sense of humour and some choice Italian words. Ireland is different. They drive on "our" side of the road, are (mostly) patient and courteous and, best of all, you get time to enjoy the scenery. And what sights there are to see. From the pretty south to the rugged west and to Northern Ireland (part of the United Kingdom), it's just one spectacular view after another. A recent trip took us from Belfast to Londonderry (Derry) along the Causeway Coastal Route over several days of leisurely driving and stops for photographs at carefully signed vantage points around the coastline. Best of all, if you travel as a free spirit without forward reservations you can choose from hundreds of friendly bed and breakfasts, or delightful pubs where there's no need to drive any further after dinner and a gutsy Guinness. Channelling American novelist Jack Kerouac (famed for his book On The Road), there's a feeling of exhilaration and anticipation as we hit the bitumen from Belfast, a city which has had its own share of excitement in recent history. 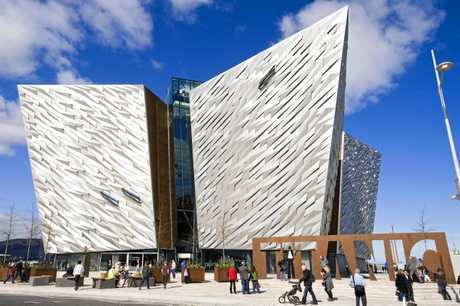 We regret saying goodbye because there is so much to see and do there, including the impressive Titanic precinct, the street murals around Falls Rd, the markets, the pubs, the music...Belfast has the feel of a liberated city with a vibe that shouts "freedom". 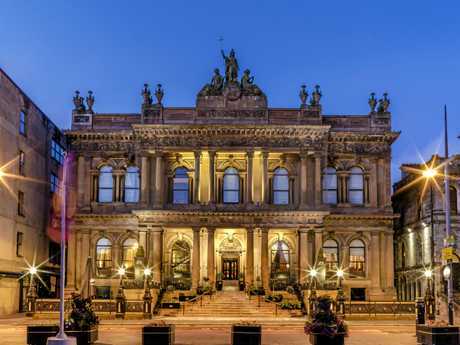 We're also sorry to leave the comfort of the Merchant Hotel, a beautifully restored bank building and arguably the best breakfasts in the whole of Ireland. 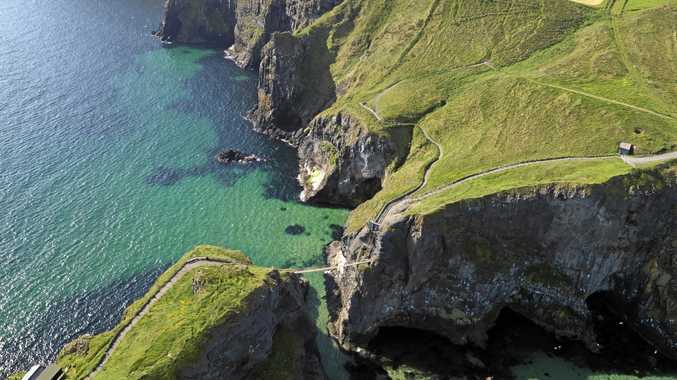 But depart we must, and here are some of the highlights we encounter along the 400km Causeway Coastal Route. Suffer from vertigo? Well I do, especially after seeing the Hitchcock film of the same name. But here, you need to grit your teeth and, whatever you do, don't look down as you make the shaky crossing. After all, it's less than 100 metres to reach tiny Rathlin Island where salmon fishermen used to cross to their nets. 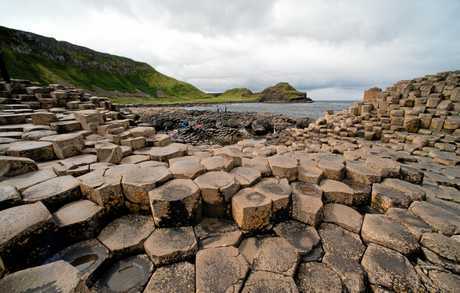 Close to the northernmost point of Ireland is this phenomenal sight stretching out into the Atlantic, a rocky causeway created by Irish giant Finn MacCool, known at that time as Big Mac. Mac's purpose was to join Ireland with Fingal's Cave in Scotland so that the giants on either side could conveniently fight each other. That's the story, although geologists are non-believers and have a different explanation involving volcanic eruptions about 60 million years ago. 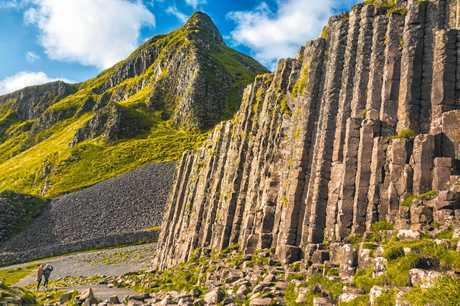 Whichever story you believe, the Giant's Causeway is an experience not to be missed on your coastal journey; indeed it's been awarded UNESCO World Heritage status and has been voted in various polls as Ireland's number one tourist attraction. All these villages are worth a stop or detour. The modernised Bushmills Hotel and Restaurant, a 16th century coaching inn, is a gem and a great place to overnight, especially if you indulge in a tasting at Old Bushmills, the world's oldest licensed distillery, which opened in 1608, luckily a short stagger from the inn. 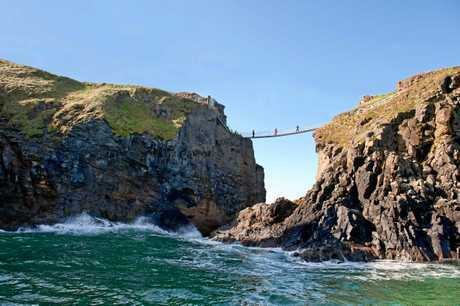 Portstewart is another village with excellent accommodation near the Strand, a popular three-kilometre sandy beach. Londonderry or Derry. Don't be confused by the names, as we were. 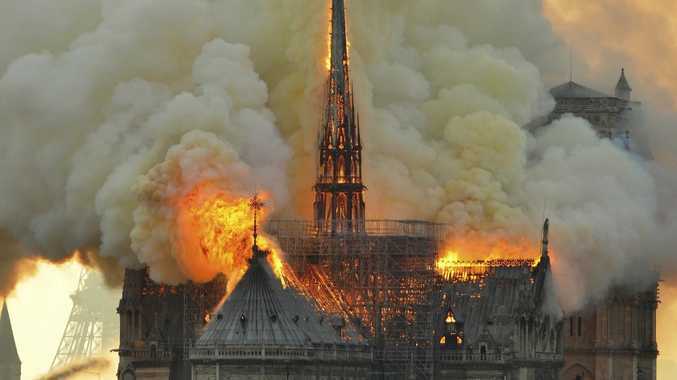 It's the same place, with a complicated history resulting in two names. This is a tricky subject best explained in references from Google, but the shorter form (Derry) seems to be in common usage and it's easier if you're hashtagging on Instagram. 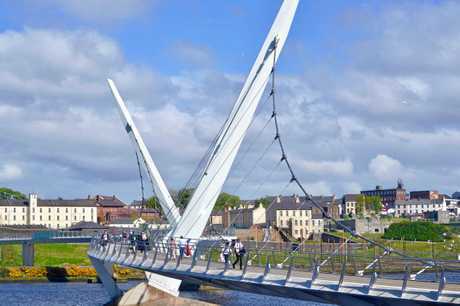 In fact, Derry is a story in its own right but it is most certainly the highlight as well as the finishing point of the Causeway Coastal Route. It's the only remaining completely walled city in Ireland and a walking tour around the 17th century walls is an absolute must. Tour guide Charlene McCrossan explains the long and somewhat tortured history of the city, including more recent events known as "the troubles", which still linger. On a positive note, McCrossan points to the new forward-looking spirit of the townspeople, particularly the emphasis on tourism. A newly opened modern restaurant called the Walled City Brewery is a prime example of that. One evening, we head to a local pub desperate to find a genuine Irish stew. Greeted by a bunch of locals at the bar, "where ye coming from? ", we inevitably end up discussing rugby. Given the current record of the Wallabies, we change the subject and ask about the stew. The barman produces a ladle and dips it into a big tureen behind the bar. A huge bowl filled to the lip emerges. "That will be five Euro, including a pint of Guinness," he says. A memorable evening, including a well-known troubadour with guitar, is typical of even the most modest of pubs, and a fitting way to end what has been at the top end of road trips ... at the top end of Ireland.